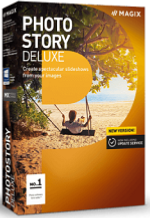 With Photostory Deluxe you can create entertaining videos from your most beautiful shots. Create amazing videos out of your photos in no time at all and in resolutions up to Ultra HD. Impress your friends and family with a captivating slideshow and experience your most memorable moments again and again on your TV, smartphone or tablet.